SodaStream is at it again, creating funny content with a good message at the heart, with the help of some big stars from around the world. 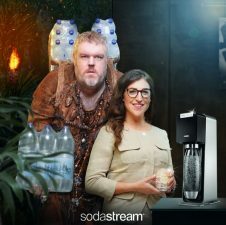 The latest SodaStream campaign features Mayim Bialik, who plays Dr. Amy on TV Show The Big Bang Theory, and Kristian Nairn who plays Hodor on Game of Thrones – the best, most tragic character ever. The video explores an ancient tribe of humans called the Homoschlepiens, and Mayim’s bid to uncover more about their ridiculous habits. Check it out below.